The era of universal or even dedicated controllers is coming to an end, or well it’s around the corner and you really don’t have to look that far off to see why. onecue is a nifty little device with some surprisingly big functions, allowing users to control an array of electronic devices through simple gestures. And you thought Kinect was really beginning to kick things up a bit. 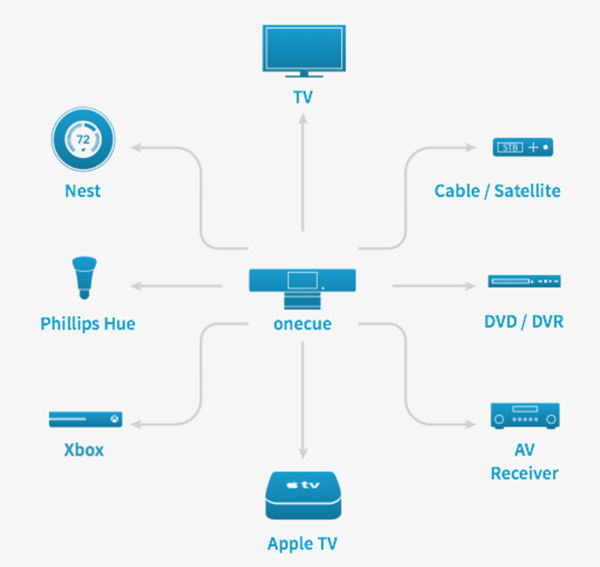 onecue has one very simple purpose of existence; to connect your home devices, including your TV, Apple TV, AV receivers, DVD or Blu-ray players, or even a smart home setup under one roof for touch-free controls using a single interface. Your devices can be based on infrared, Bluetooth or Wi-Fi; onecue will allow you to control all of them from the comfort of your couch. I mean when was the last time you hushed your TV to mute it? eyeSight – the developer – has added in not just the ability to turn your devices on or off, but control them as well. For example, connected to your regular non-smart TV, onecue will simply use infrared to turn on the device, followed by gesture recognition for changing channels and controlling volume. Similarly, onecue can connect to smart home based devices such as Philips Hue to control the lighting or even move the blinds on your windows if they are remote controlled. Magic. onecue can be mounted on your TV, but it can be placed anywhere else as well, though it is advised you place it at an angle and distance from where the device can use its camera to easily identify all those gestures. The developers say that the ideal distance between the user and onecue ranges from 4 ft. to 16 ft. IR controlled devices can be best controlled if they are in the same room or in the line of sight, however eyeSight is also bundling in a ‘repeater’ that acts as a booster to enhance signals in case you need to control devices that are in the other room, or out of the line of sight. This little marvel comes with a 3-inch LCD display as well which serves in identifying the current device being controlled by the user and providing confirmation of any performed function. For now, onecue can be pre-ordered for a mere $129.99, but the price will jump up to $199.99 once the product begins shipping around early 2015.